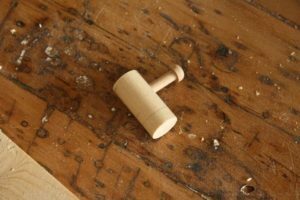 Today I am going to show you how to make homemade wooden train couplers. I made a wooden train for my son for Christmas, and struggled with how to connect them all. This solution makes it easy to connect each train, and they are more secure than magnets. They are also made from traditional materials, which I like. Here is a sneak peek at the train set that I will have tutorials for on the website. There is an engine, open top car, log car, tanker, and a three tank car. 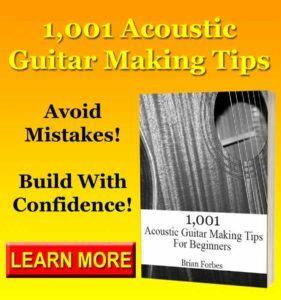 Each one will have a complete tutorial that explains the building process in an easy to follow manner. The train couplers are all the same though, so I am covering that first. You will need a 5/8 inch diameter dowel for your train couplers, as well as a piece of sturdy leather. I selected the 5/8 inch dowel size because the wood used for the cars is a little thicker, and can easily be drilled into. The leather can be from anywhere, just make sure when you stretch the piece that it holds well. If you do not want to use leather, you can use any other sturdy fabric. Before you can start drilling for your couplers, you need to make an easy jig for the drill press from a piece of scrap wood. This jig will help you center the hole on the dowel. It is not easy to drill right through the center, so the jig is important. Cut a piece of scrap that is as long as your drill press table, and a couple inches wide. Then, use the table saw to make a 1/4 inch wide slot through the middle. Make the slot 1/4 inch deep, which is enough to center the dowel. Next, chuck your drill bit (which is the size recommended for your store bought axles) into the press. Mine is 3/16 inch. Lower the drill until the bit is centered in the slot, and then clamp the jig in place. This aligns the drill, and it will drill directly through the top of the dowel. On the rear clamp, you can use it as a stop so that the holes for the pins are drilled in the correct spot. For the trains in my tutorials, this is 3/8 inch from the end. The way the jig works is that the dowel naturally falls into the slot when you place it on the drill press. 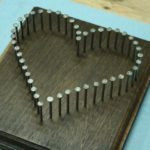 Since you centered the slot before you clamped it to the drill press, the drill will go through the top center every time. When you drill your wooden train couplers like this, the axle pin will stand up nice and straight. The train couplers will look good, and the process will move very smoothly. Set the dowel on the jig, and lower the drill until it goes almost all the way through the thickness of the dowel. Set the stop so that the drill cannot advance any farther. Now, the drill and jig are ready to be used to make train connectors. 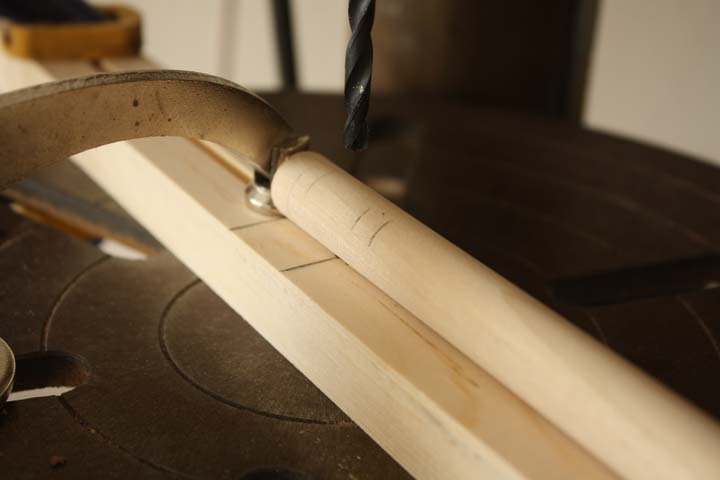 Slide the dowel into the jig until it hits the stop at the end. Then, turn on the drill and lower the bit until it hits the stop. Retract the bit, and move on to the next step. Measure 1-1/4 inches from the end of the dowel, and make a mark. This is the length that you need to cut down the dowel for all of the couplers on the trains. If you did a test fit of the axle peg before you cut the dowel, remove it before you cut the dowel to length. 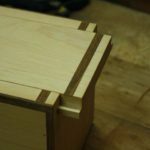 Use a miter saw or a band saw to cut the piece. After the cut, take a look at the placement of the hole by inserting a peg and looking from the end. Make sure that the hole is perpendicular to the dowel, and make any adjustments on your jig if necessary. I bumped my jig somewhere along the line and had to make a few more of these to have the number I needed. You will need to make one of these for the engine car, and two each for every other car you plan on building. Here is my set of wooden train couplers. 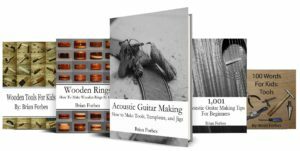 They are very simple, and easy to work with. 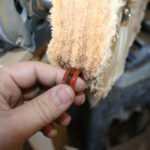 At this point, you can use sandpaper to round over the end nearest to the hole. Also, sand the end grain to remove the saw marks. Only do this on the end that is near to the hole. The other side will be glued into the body of the train cars, so you are not going to see that end. Sand them now, because it’s much easier before they are attached to the wooden trains. Once you have the dowel portion of the train couplers made, you now need to work on the leather or fabric. This will be mounted to one end of the train, and then slip over the peg on the next train to link them together. Start with sturdy leather or fabric, and cut pieces that are 1/2 inch wide and several inches long. Each strip will be 1-1/4 inches long, so cut as many as you need for all of your cars. For the leather I worked with, I found that using a straight edge and a hobby knife was the easiest way to get the edges nice and straight. You can also use a scissors, just take your time and leave clean edges. Next, cut the strips to length. This will vary depending on what your specific needs are, and you can change this easily. For my trains, the length of the strips is 1-1/4 inches. Lay the strip out on the bench and use a hobby knife to cut them. Make sure that the ends are square. You can also use a scissors, but again take your time. Cut as many strips as you need for your wooden train cars. Each car takes one strip, which is permanently fastened to one end. I recommend keeping a few extra in case you end up needing a replacement somewhere down the line. Next, you need to punch holes into the strips so they can be installed on the trains. 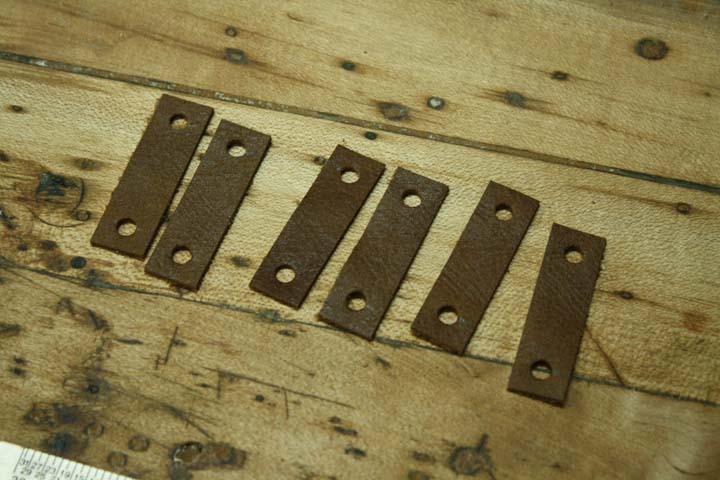 The pegs I used allowed me to punch a 3/16 inch diameter hole through the leather that was 3/8 inch away from each end. 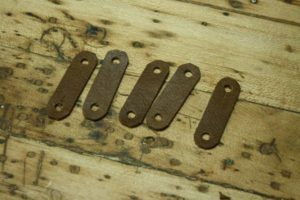 I used a leather punch tool for this process, but for most leather or fabric, a simple hole punch can do the same thing. You can also carefully cut the hole with scissors of need be. In order to get a nice round hole, the leather punch is definitely the best tool. I found mine in a craft store for about $20, which is inexpensive for what the tool can do. There are plenty of other uses too, which make it worth the money. Now, one of the holes needs to have a small slit. 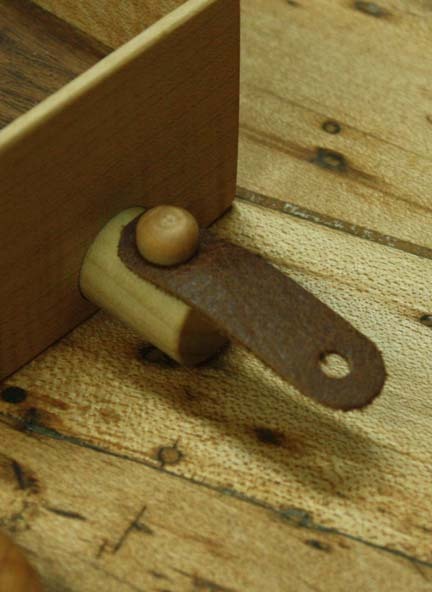 This allows the opening to become larger and go around the head of the pin on the next wooden train car. 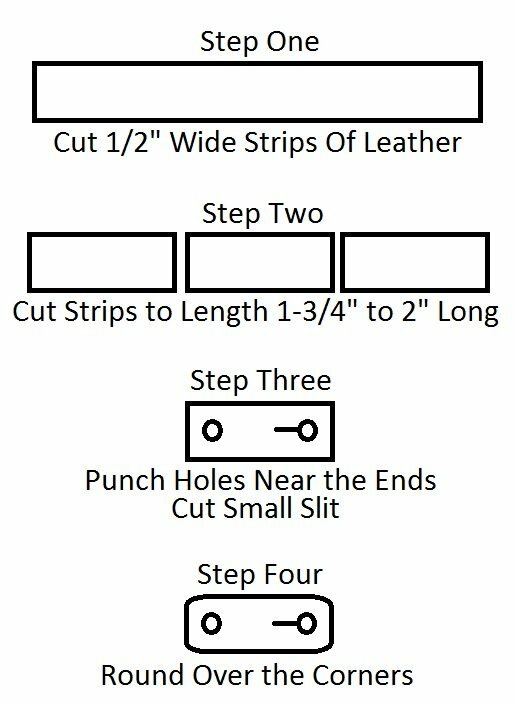 Pick one hole, it doesn’t matter which, and cut a small slit that is 3/8 inch long. Begin the slit at the center of the hole, and cut towards the middle of the strip. A hobby knife does this perfectly, but scissors work too. Look further down in the article and you will see a diagram of what this slit looks like. The picture above has the slit in place, but it may be easier to see on the diagram. Installation is a matter of drilling a 5/8 inch hole that goes 1/2 inch into the end of each train car, and then gluing the dowel in place. This will be covered more in depth on the instructions for each car. There are two sides to the wooden train couplers that make the system work. The picture on the left shows the pin side of the coupler. The dowels are the same for each connector, the only difference is how you place the axle pegs. For the pin side, drip some glue into the small hole and drive a full length axle peg inside. Make sure not to over fill the glue, otherwise it will come out of the hole and get all over the larger dowel. Turn the peg a few times to evenly spread the glue in the hole. Then, allow it to dry for a couple hours. 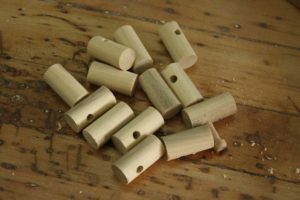 You can finish the pegs before or after you insert them, and with a hand applied oil the process really isn’t much harder. On the other side of the wooden train couplers you can install the leather or cloth strip. This is a permanent mount, because the axle peg will be glued in place. However, of one of these is damaged somehow, the axle head can always be cut off and drilled out for a new leather strip. The standard axle size is too long for the hole on this side of the train coupler. You need to cut the length of the pin down to around 1/2 inch depending on how deep you drilled the holes. After you have the axle pin cut down, do a test fit to make sure it goes all the way down to where the head contacts the larger dowel. 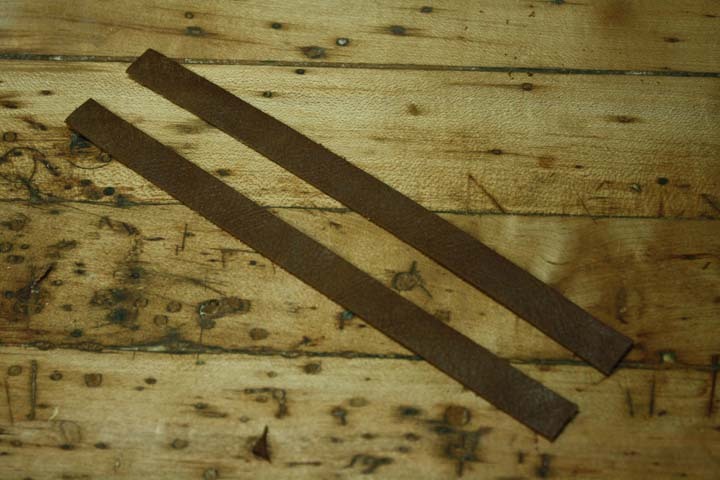 Finish the larger dowel first before you add the leather train coupler strip. It can be finished later if you want, but it will be a little frustrating going around the leather. Push one of these shorter pins through the hole in the leather strip that does not have the slit, and then drip some glue into the hole. Press the pin into the hole, and straighten out the leather piece before allowing it to dry. 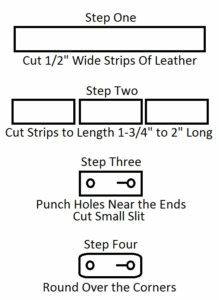 Here is the diagram that I promised to help show you the process for making the leather strips. 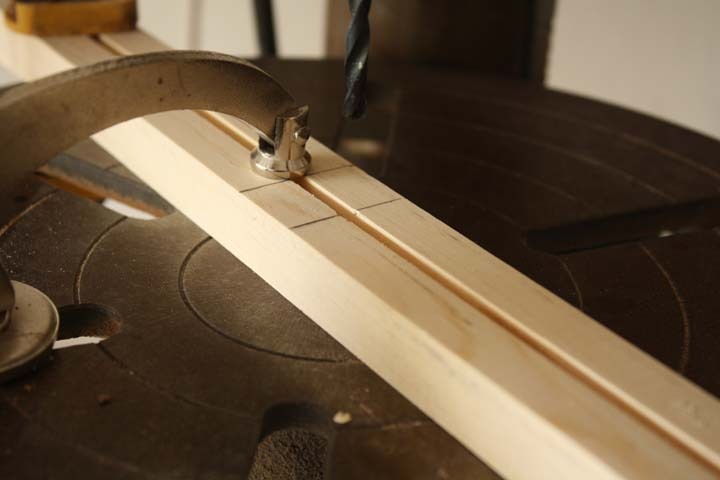 This outline can be applied to any size strips that you need, and for any kind of wooden train that you have made. This strip is what makes the wooden train couplers work. 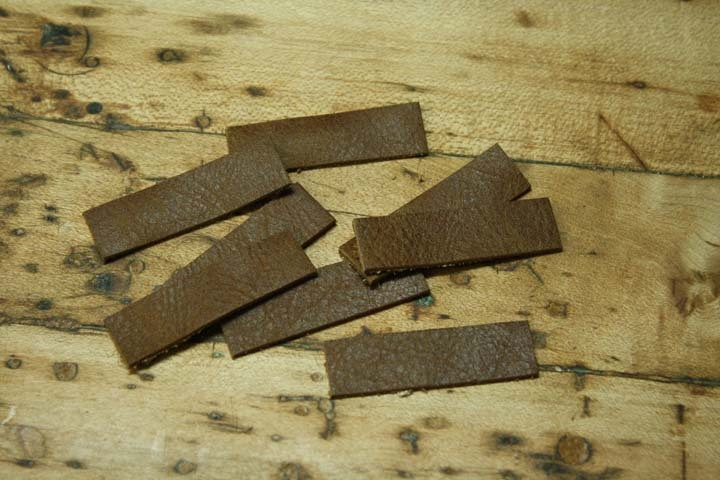 As long as you use sturdy leather and cut everything nicely, the strips will last for a long time. My son has been twisting them and pulling on them and they still look as fresh as when they were installed. If you are using cloth instead of leather, you may decide to sew together a few layers of a heavy cloth, and then sew around the edges to keep them from fraying. Also, look for a cloth that does not stretch very much, like a duck cloth or sail cloth. To connect the trains, simply slide them near each other. Then, slip the end with the slit over the peg on the next train. Slide it down to the bottom of the peg, and then the trains will pull each other. These wooden train couplers will hold nicely, and have a traditional look. 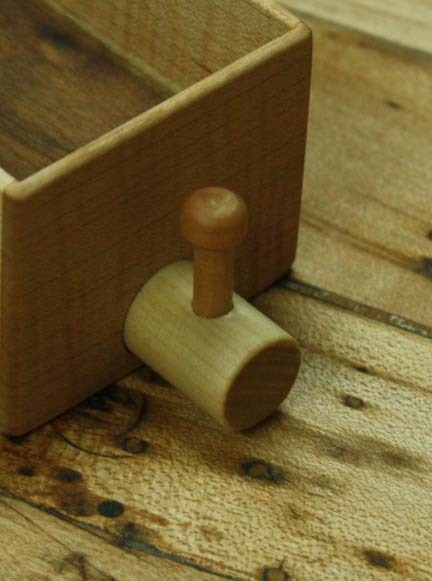 If you have any questions about How to Make Wooden Train Couplers, please leave a comment and I will be glad to help. Also, please share my work with your friends on Pinterest! 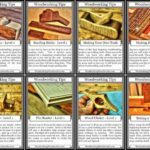 As I make the tutorials for the other handmade wooden trains available, I will link to them in this article. Each train will be explained one at a time. 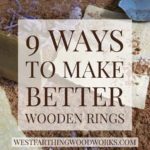 They are all easy to make with common shop tools, and are sure to become family treasures. Happy building.